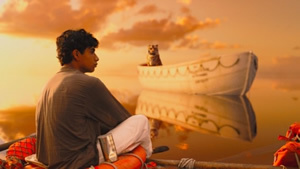 Life of Pi is gorgeous filmmaking that slowly grows its appeal to the mind while constantly pleasing the eye. Based on Yann Martel’s novel, Life of Pi is a colorful parable that at the outset promises viewers they will, by the end, believe in God. That bold promise is made by way of man named Pi (Irrfan Khan, The Warrior); he has an incredible story to tell and he has an audience eager to listen. That audience is a struggling writer (Rafe Spall, who played a not-so-struggling writer, Shakespeare, in Anonymous) who visits Pi after a mutual friend puts them in touch. Pi’s story begins with a Jean-Pierre Jeunet vibe; it’s frisky and artful. Perhaps it’s the Parisian setting. Maybe it’s the humorous storytelling of troubled youth, styled in a colorful Amelie fashion. Pi is named after the Piscine Molitar, an elegant swimming pool in Paris. Unfortunately, as kids are wont to do, the name Piscine is used as a weapon of mass dysfunction by Pi’s schoolmates, who ceaselessly play off the “piss” sound of Piscine. But Pi’s a smart kid and he’s able to stem the tide of taunts by, class after class, extolling the importance of the number pi. In math class he defines pi to a couple chalkboards worth of digits and forever after became known as, simply, Pi. Pi, as so many smart kids do, abounds with curiosity and he takes it upon himself to study three religions concurrently. He’s a Catholic Hindu who also studies Islam. Yeah, in one scene he says, “Thank you, Krishna, for introducing me to Christ.” It works out well for Pi. Now he has the opportunity to feel guilty before more than 1,000 gods. Pi’s story revolves around a traumatic, life-altering event he experienced as a young man (newcomer Suraj Sharma). Once upon a time his family, which owned a zoo, decided to pack up and start fresh in Canada. That meant crating up all the animals and taking off for the New World. A storm sets in en route and turns Pi’s life upside-down and inside-out. In the aftermath, he finds himself on a lifeboat with a Bengal tiger, a zebra, and an orangutan. His family’s been lost at sea and it’s up to him to survive and find his way back to land. At this point, the movie’s narrative pace slows down substantially while the visual elements soar. The storm sequence is remarkably well executed and it’s merely the beginning of some wonderful sights. Technically, Life of Pi stands as a monumental piece of filmmaking by director Ang Lee, whose film repertoire features a staggering range of genres and subjects, including Brokeback Mountain; Sense and Sensibility; and Crouching Tiger, Hidden Dragon. Many of the visual effects are jaw-dropping in beauty and technical acuity and it’s clear Lee uses the fanciful story as a playground for cinematic experimentation. There’s a curious use of shifting aspect ratios. Most notable is a slight shift from 1.85:1 to a scope ratio of perhaps 2.20:1 wherein some flying fish appear from out of frame compared to the other elements, yet still on screen. It’s a nifty, inventive visual trick, particularly in 3D. On screen, yet out of frame. A second aspect ratio shift is for a very brief aerial shot at a much more dramatically altered ratio of 1.33:1. The tinkering doesn’t come across as particularly gratuitous; it’s actually rather fun. And it’s not so much a novelty in concept following Christopher Nolan’s shifting aspect ratios in the IMAX presentations of The Dark Knight and The Dark Knight Rises. What Lee does, though, is up the ante in terms of pure playfulness. On the surface, the story doesn’t pass the reason test. “Reason” is what Pi’s father advises him to begin with in his analysis of Catholicism, Hindu, and Islam. Yet, as Pi also learns, science explains what is “out there” and religion explains what is inside. Pi tells of how his fear of the tiger helped keep him alive while caring for the tiger and feeding him gave his life a purpose while adrift at sea. As he struggled to keep his wits about him and the tiger at bay, Pi opened the boat’s survival kit and read through the manual. Among the gems of wisdom was the simple bit of advice to, above all, not lose hope. Underlying that need for persistent hope is an equal need for persistent faith. Indeed, Pi acknowledges that doubt itself is what helps keep faith alive. With those rather weighty thoughts tossed into the fray like a life preserver on choppy waters, Life of Pi does slowly work its thematic magic. That’s not to say viewers far and wide will, at the end, truly believe in God. However, Pi does things up into a sensible conclusion that is reinforced by an insurance company’s demand for a “real” story to include in the paperwork for his claim. It is indeed an impactful, thought-provoking ending, one that lingers in the mind. At the same time, though, it’s a long ride to get there. Brent Francis: Can't resist mentioning... apparently someone forgot to tell projectionists about the aspect ratio shifts on screen. The Film-Tech website has a page of puzzled techncians trying to figure out why the picture suddenly shows past the edges of the curtains.